The Significant Seven by John McEvoy, a Mysterious Review. Review: Former marketing executive Jack Doyle, who is currently "between opportunities", agrees to work with the FBI to investigate a number of horse spongings at a local Chicago racetrack, only to be drawn into series of highly coincidental deaths of lifelong friends and partners of a valuable horse in The Significant Seven, the third mystery in this series by Jack McEvoy. Following the losses of some heavily favored horses at Heartland Downs, veterinarians have found pieces of sponge wedged within their nostrils. The sponges restrict the flow of oxygen to the horse, causing it to tire easily. Contacted by the FBI (with which he had previously worked undercover), Doyle accepts the position of stable agent for Ralph Tenuta, a leading trainer at the track who has also agreed to help the FBI in their effort to identify the culprit. As Doyle's investigation proceeds, the members of one of Tenuta's clients, seven men known to the press as The Significant Seven after winning nearly $1 million years ago on a Pick-6 ticket, begin dying. Their deaths are all listed by the authorities as accidental, but the remaining living men are suspicious that one of them may be killing off the others to gain control of a Tontine-like agreement that the group drew up to manage their winnings. Doyle is suspicious as well … and his curiosity soon makes him the target of a very adept — and creative — killer. The sponging investigation is a clever way of getting Doyle — who is at best an amateur sleuth with no other credible reason to be there — to participate in activities at the track and hence involved in the murders of The Significant Seven. The Tontine plot device isn't all that original, but also isn't used often enough by authors to be routine. Here, McEvoy incorporates it to good effect, initially alternating the narrative between points in time and later points of view. 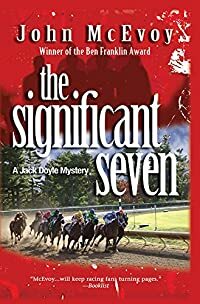 The ending is slightly anti-climatic, involving a fortuitous cell phone call rather than deductive reasoning on the part of Doyle to solve the case, but overall The Significant Seven is a soundly plotted, very enjoyable mystery written from the perspective of an insider who knows the horse racing business very well. Acknowledgment: Poisoned Pen Press provided an ARC of The Significant Seven for this review.